Kampung Air Batang, also known as Ayer Batang, abbreviated as ABC Village, is another popular tourist destination on Tioman. 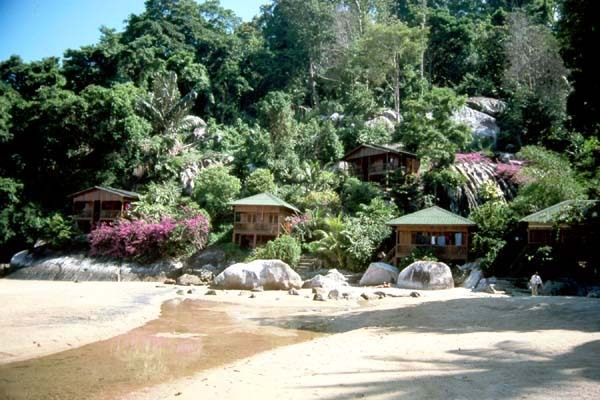 There is a wide range of budget chalets and resorts with the cheapest rates from Tioman. It is one of the most popular choice among backpackers and travelers who want to travel easily. 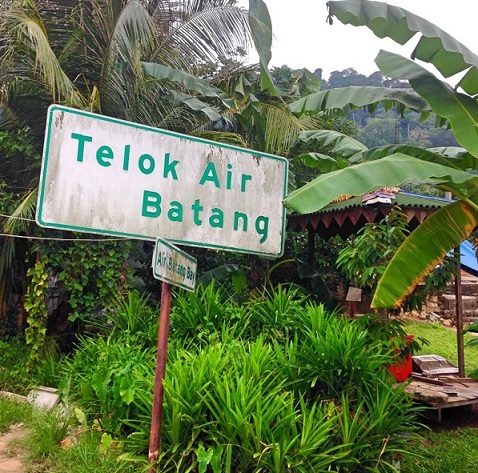 Air Batang almost borders the village of Tekek, but is separated by a small and hilly hill on the coast. here the most used means of transport is the motorcycle. Towards Tekek you have to cross the small hill with a neat path. 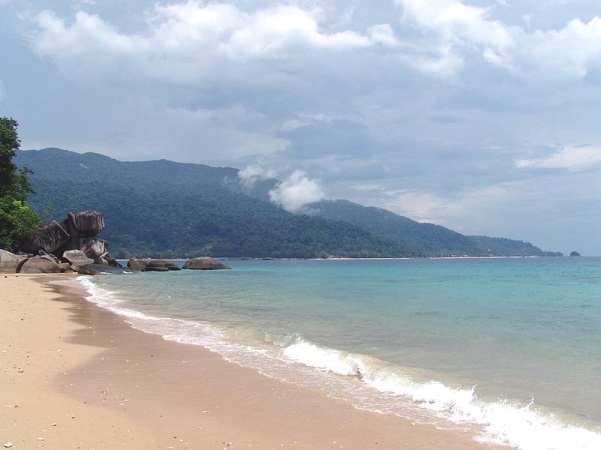 The popular beach for backpackers on the west side of the island is located in Kampung Air Batang. The end of the season is around the end of October, when on some days there would only be a handful of visitors. It was so peaceful in the late season that even a large python was spotted, while he lay lounging under a tree near the bridge to Bamboo Hill. The ABC beach is best at the southern and northern ends, although the sand is constantly shifting. Most of the beach is rocky with little sand. The narrow paths that lead you through the village give the feeling of a lost and found paradise. But the snorkeling and diving from the beach is simply sublime! 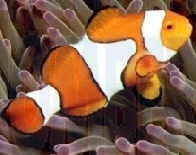 The corals are beautiful and the residents remain friendly and cheerful, despite the daily bustle of the visitors. ABC Restaurant - This is a favorite place for backpackers and other guests. The food is reasonable and seafood fresh as it should be, but especially the Asian dishes. Prices are a bit high. Nazri�s Place II; Hijau restaurant - The restaurant is open for breakfast, lunch and dinner and also in between. It has a nice, relaxed atmosphere and is located on the second floor of a wooden house. There is a good view of the sea from the balcony. Indian, western, local and barbecues are served. The staff is friendly and helpful. SPC (South Pacific Chalet) restaurant - Seafood is fresh, the prices were reasonable and fruit juices were fresh. The "fish and chips" were delicious and the fish platter fresh and juicy, the burger was tender. Good meal, pleasant atmosphere and good service. Mawar Chalets & Restaurant - One of the better restaurants on ABC and it also has good prices. They serve the usual Malay - Asian food, as well as some Western dishes such as chicken burger and fries. Nazri�s Place restaurant - This restaurant is known for the best food of the kampong and there is a real kampong feeling. Next to Nazri's is the Sunset Bar, which is also known for its delicious food, but also for its cocktails and beer. Some of the dishes are pizza, fried chicken wings or a chicken sandwich. Now imagine that the heat of the day cools down, sunset, sandy beach, gentle mood lighting of the bar, a long cold glass of beer, fried chicken wings fresh from the wok .. delicious! "The Sunset Bar ended up being our favourite place for a few cheeky beverages on Pulau Tioman. Happy hour is from 5pm � 7pm (3 beers for MYR12, that�s AUD$1.34 per beer!) and delicious pizzas to chomp down on as you watch the sun setting�. However, we never actually saw a sunset due to afternoon storms over the ocean blocking the beautiful spectacle. It�s all the way down the Southern end of ABC and can take about 15-20 mins at a leisurely pace from the Northern end. The main drawcard for us was the welcoming nature of the the bartender, Farah. Somehow Farah manages to make the pizzas, keep the drinks going and chat with the customers all at the same time. The owner of the bar, Anita, runs the till and is out the back for most of the time fulfilling food orders to but comes out to chat with customers. Due to Malaysian authorities banning Muslim people from selling alcohol, the beverages can run out before 10pm however there are a couple other little bars scattered along the pathway."